Systemic leadership changes everything. Once you get into the habit of taking a systemic perspective, you begin to observe leadership with a new focus. In the systemic model, leadership is a property of the organisation, not of the people inside it. Instead of viewing the organisation as a passive vessel waiting to have leadership poured into it, the organisation becomes an active player that has to contribute to leadership if it is to receive its due from managers. 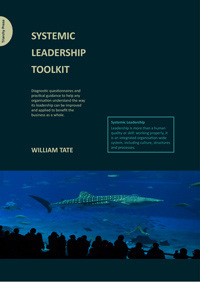 The connection between leadership and its host is symbiotic, with the organisation proving a vital partner both to leadership and improvement. The majority of management programmes and development courses are built on the belief that good leadership is a quality that is demonstrated by talented individuals. Consequently, the traditional model for improving leadership is to solve perceived gaps in performance by sending managers to be trained. But in this model, little or no attention is paid to the systems within which these managers have to function day-by-day. Workplaces can be fear-ridden, unsupportive or bureaucratic – not because they are full of nasty or officious individuals, but because over time the organisation-wide systems and processes have resulted in the creation of a toxic environment. Once inside such environments, the leaders and managers may get so used to the leadership culture that they lose sight of its shortcomings, rather than being able to see clearly what is needed to improve it. Any training that is conducted away from this problematic environment will ultimately be ineffective: once they are returned to it and its daily pressures, those managers will revert to type. Why do we cling to such a dysfunctional model? The answer is that, over a long period of time, the idea has taken hold that we live in an individualeconomy (to quote the management writer Simon Caulkin). Organisations are assumed to succeed because individuals succeed, and fail if individuals fail. But this notion is false. Take the global banking crisis. The banks didn’t suddenly collapse as a result of individual leaders’ lack of skills or poor behaviour; it was the dynamics of the banking system that played the major part. The fact is that we live in an organisationaleconomy. Businesses, trade and society work (or fail) because of the way organisations operate as systems in delivering outcomes: products and services. Individuals and their skills are just one input to this end. What matters is the way the organisation glues those individual contributions together – how it binds people in meaningful and purposeful relationships with one another and with the organisation’s needs. And that comes from what organisations surround people with. When Systems Thinking is applied to the study and practice of leadership, it becomes clear that the system fails leaders as much as leaders fail the system. Just look at the current UK parliamentary expenses fiasco. Blaming individual MPs and demanding honesty and repayment may be an understandable reaction, but it doesn’t solve the problem. There is a flawed system running in the background that surrounds the MPs. This system includes past norms, expectations, peer pressure (to be restrained, as well as to keep up with the Joneses), accountability structure, secrecy/transparency, parliamentary officials and committees, auditors, frozen salaries and perceived basic pay injustice, etc. Displaying leadership – including moral leadership – isn’t easy in a quagmire. If we want to improve people’s behaviour in an organisation we need to examine the system and look at what people are surrounded with. Leaders often create their own mess, or fail to notice that entropy is doing it for them. And they often have to clean up the mess themselves. But most leaders are part of the system; they do not have the luxury of watching comfortably from the outside. The language of systemic leadership is slowly but surely becoming part of the public vocabulary. ‘Systemic failure’ is increasingly cited in public reports and investigations, including those in response to Hurricane Katrina, deaths caused by poorly equipped military forces and the global financial crisis. There is less and less confusion between the terms ‘systemic’ and ‘systematic’. And while, in the wake of tragedy or scandal, the burden of accountability all-too-often still falls on the shoulders of individuals, the public is fast becoming wary of the practice of scapegoating. We are starting to notice when attempts are made to divert our attention from more serious and entrenched errors. In any kind of management, leadership or development role, a sophisticated understanding of how organisations work as systems is vital. Systems Thinking offers explanations of failure – whether it is personal, collective or of a whole organisation system. But this is just the first step. In fact, this is the easy bit. Those who have got this far often know little of what to do next with their newfound understanding and vocabulary, beyond mouthing the mantra that ‘lessons will be learned’. The crucial next step is in how they respond. Those fondly quoted ‘lessons’ are rarely learned because the response is not systemic. You can’t fix systemic problems with old-style leadership, with its top-down approach consisting of edicts, targets, incentives, punishments and training. Leadership of the system is called for.